Our smartphones today have evolved into powerful computers. More powerful in fact than all of NASA, back when it put the first astronauts on the moon. No wonder then that they’re increasingly becoming our primary personal computing devices. Apart from the obvious uses, the abundance of communication and business-related apps enable us to handle a chunk of our work right from our smartphones. The only major hurdle is screen size, and that’s something Andromium wants to fix. A software built to work with MHL-enabled smartphones, Andromium OS turns your phone’s interface into a Windows-style layout, letting you mirror your screen to an external display for a PC-like experience. At MWC in Barcelona, we got a chance to check out Andromium at MHL’s booth, and meet with Andromium’s CEO Gordon Zheng to find out more about what this software can do. So how does Andromium work? It’s actually an Android app (available as a free public beta for now), which can be downloaded onto any Android KitKat-running smartphone. While you can use Miracast or a Chromecast to mirror your device’s display, Andromium is designed to work with MHL, which being a wired connection, not only keeps lag to a mimimum, but also charges your device in the process. Once you launch Andromium on your smartphone, it changes the interface to one closely resembling a Windows layout. There’s a start button at the bottom left, from which you can access all the apps on your device. On the phone’s screen, the layout and icons look tiny, but when viewed on a larger display, it’s very usable, and intuitive. Andromium OS has a few native apps like a browser, file explorer, calculator and even Minesweeper. Supported apps include a bunch from Google’s suite, like Chrome, Drive, Email, Gmail, Play Movies and YouTube. The ‘Untested’ folder contains the remainder of the apps installed on your smartphone. These work fine too, although they aren’t optimised for Andromium. Any other files stored on your smartphone, such as photos, videos, music and more can be accessed using Andromium’s file manager. One of the biggest perks of Andromium is that you can continue to use your smartphone to take calls with the app running in the background. Using an Andromium setup may not be as powerful as your regular PC, but offers a very Chromebook-like experience, and that’s more than enough for basic use. 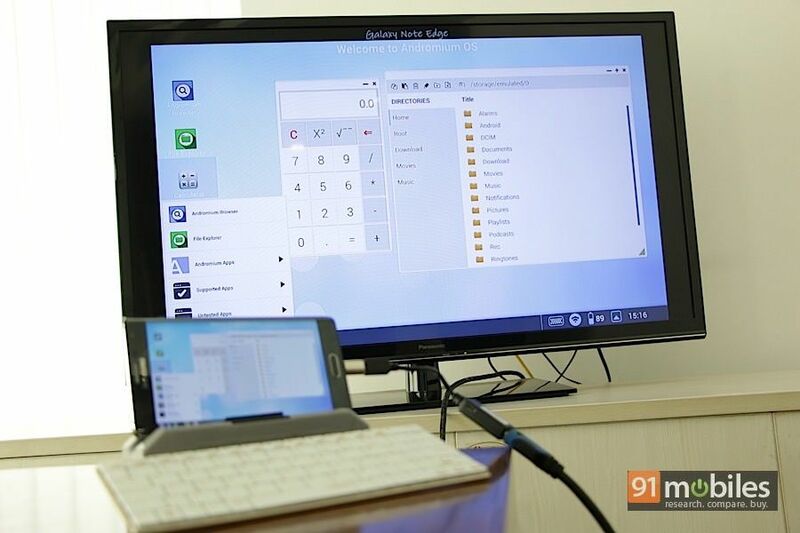 When Andromium was first being developed, Zheng was looking at providing users with an MHL dock that would not only enable users to connect their smartphones to an external display, but also let them hook up a keyboard and mouse for a PC-like experience. The dock was listed on Kickstarter, but didn’t achieve the kind of funding Andromium was hoping for. But now, the company is working directly with MHL to deploy Andromium on ‘smartbooks’. A smartbook looks like a laptop, but is just a screen and a keyboard without processing capabilities of its own and using the connected phone’s hardware instead. It seems like a far more workable concept, considering that users won’t need to have a separate TV/monitor, keyboard and mouse to use the software. But what makes it an even more interesting proposition is that Andromium is working to recruit partners like Micromax and BLU to provide these smartbooks in a package with their new smartphones. According to Zheng, working with established smartphone makers would not only give Andromium greater reach, but also let them provide warranty services inside the box. Apart from its obvious benefits, one of the things that makes Andromium so interesting is Zheng’s greater mission, which is to bring PCs into the hands of as many families in developing countries as possible. India is the market Andromium is hoping to launch in first, and given the massive smartphone penetration here, Zheng’s mission doesn’t seem too far-fetched.